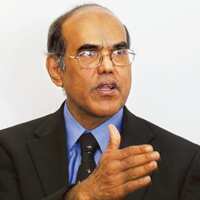 Mumbai: Reserve Bank of India (RBI) governor D. Subbarao says the monetary measures taken in the past six weeks have started showing results with liquidity returning to the system and bond yields coming down, but that the crisis is not over, yet. He adds that he is ready to take all actions, conventional and unconventional, but that he does not necessarily have to do this during half-yearly or quarterly policy reviews. Four days ago, you had cut the policy rate by 100 basis points, but today your statement sounded very hawkish with a focus on inflation and high credit offtake. It looks like there are contradictions in your stance and we are confused. Thank you for this opportunity to clear your confusion. We are going through an uncertain time. The international financial situation is very fluid and that’s transmitting to us. Nobody is able to comprehend what has been happening. Growth, price stability and financial stability are three equally important concerns for us and I am not willing to put one over another. All along, we have taken financial stability for granted because we did not have any problem. So, the monetary policy management was (about) balancing price stability and growth. This time around, financial stability as a policy priority has come to the fore. In a manner of speaking, the stance has shifted for balancing between growth and price stability to balancing among growth, financial stability and price stability. Inflation is 11.07% and you cannot let your guard slip on inflation. We have injected liquidity to ease the constraints across the system and ensure flow of credit for productive purposes. As long as bank credit goes to productive sectors, we have no problem. You are not in favour of expansionary monetary policy at this point. Is this the voice of real RBI? What we had seen in the past six weeks was a very different regulator. In fact, North Block (the finance ministry) was in the driver’s seat. No, I don’t think so. Whatever we have done over the past one-and-a-half months have been at the initiative of RBI. What we did in the past and what we have done today is essentially RBI’s judgement. RBI and RBI alone is in the driver’s seat. We have consulted a number of stakeholders and the government, of course, has the responsibility in a democracy for the smooth functioning of macroeconomic system. So, the government has to be consulted, but the decisions have been ours. But RBI’s policy today is very different. Is there a shift in your stance? Not at all. We did not time our announcements to suit the requirements of the equity market. Our consideration has been to meet our task — to manage liquidity and the troubled spots in the financial system. With crude oil price coming down, people have started talking about single digit inflation by December and 5% inflation by March 2009. Are you exaggerating your concerns about inflation? Our judgement is, inflation will be 7% by March 2009. RBI’s institutional response regardless of who is the governor is to respond to the emerging situation. Dr Reddy (Y.V. Reddy, the former RBI governor) had a difficult time with the rising inflation. The situation has changed. His prime concern was managing inflation, but today the prime concern is managing financial stability and price stability. The growth will moderate. From finance secretary you have become RBI governor. Is there any identify crisis? Do you still feel part of the finance ministry? That sort of identity crisis is across all jobs. When I shifted from the state government to the Government of India, I had an identity crisis. When I moved from the government to the World Bank, I had an identity crisis. You have revised the estimate of growth from 8-7.5% for fiscal 2009. What about 2010? Won’t we see much lower growth? We have done some calculations, but it’s not in public domain, yet. It all depends on how the international situation settles and how quickly. If the recession is deep and the recovery takes longer, it is going to affect us. Our fundamentals are strong and we are going to return to the high growth trajectory, but how quickly we could do that will depend on international situation and its impact on India. Liquidity has returned to the financial system, but how long will it last? With money drying out overseas, there will be tremendous pressure on local banks. When do we see the next CRR (cash reserve ratio, which determines how much money banks have to keep with the central bank) cut? I can’t say. We are monitoring the situation continuously and we are acting without waiting for any particular date. We will continue to act with such promptness. Any time when we feel RBI should act, we will act. So, quarterly reviews are meaningless? Or, should you shift to six-weekly reviews? I would not say that. I don’t see that happening. In any case, we are managing the situation on a continuous basis and we will take action without waiting for the policy dates. The quarterly policies serve a valuable purpose. The consultation process that we go through with the bankers and others for producing the policy document is valuable for the institution. No, that is not the message. I have not asked them (to) cut deposit and lending rates. It’s not RBI’s job. We have given them two clear messages. The first is: credit must continue to flow for productive sectors, particularly for loans that have already been sanctioned, but they have stopped disbursements; for restructuring SMEs (small and medium enterprises) and other segments, which they find vulnerable. At the same time, they must keep an eye on credit quality because one lesson from this crisis is that if you let your guard slip on credit quality, you’ll get into a deep, deep problem down the line. The second message that I have given to the bankers is that RBI is there to manage the system; monetary policy, liquidity. They are free to come and talk to us and give their feedback and we will respond to that. Bank credit has grown 29% this year so far. If we want the banking system to pare it to 20%, then no bank can lend in next few months. One needs to see the nuances; 20% is our estimated projection of credit growth. We are trying to understand the dynamics behind the high-credit growth. One of the reasons, we believe, is the substitution effect. The overseas lines of credit have been drying up, exerting demand on the Indian system and credit to substitute overseas loans must flow. We will not strictly follow the numbers for their own sake; we have goals larger than numbers. The immediate goal is to preserve financial stability and ensure that the downturn in inflation continues. Yes, the growth will get moderated but we will return to the high growth path soon. You spoke about taking unconventional measures. When are they coming? We have done some unconventional measures such as special market operations for the oil marketing companies (offering them foreign exchange directly); special repo (borrowing) window for mutual funds and even reduction in SLR (statutory liquidity ratio). May be they are not unconventional enough by your yardstick. Any plan to use the foreign exchange reserves to offer special dollar line of credit to banks and companies? We will be open to all ideas; consider all options. I’d not like to say anything about the particular measure that you are suggesting. I cannot comment on this. But we do not rule out anything. Are you happy with the outcome of the measures taken so far? I think that the measures that we have taken in last one-and-a-half months have yielded desired results. The LAF (liquidity adjustment facility) window has shifted from repo mode to reverse repo (this means, banks are parking surplus money with RBI instead of taking money from it); the yield on benchmark 10-year paper has come down from 8.3-7.8%. There is liquidity in the system, but I would not say that every thing is fine and we are sailing along perfectly. There are challenges ahead.